Hmmm... Ok. Something went wrong. Lets do that again. Luckily all 5 of my boys can self rez once and hour, giving me wipe immunity up to once every 12 minutes. So lets just rez Thunduh and..
Hmm... Ok. These fellas have a rather large agro radius. No worries. We'll just release and run back. Again. And again. And again. This is how it went on for almost 4 hours. My pulling process from The Sunken Temple worked fine. 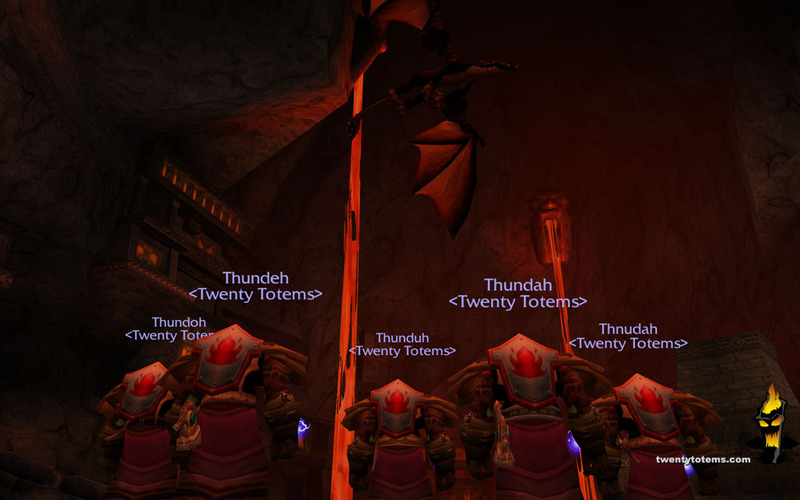 The problem was the sheer number of mobs. Sometimes a single pull, with up to 7 mobs, was just a bit too much, but normally I wiped because of pathing groups. I learned, I slowed down, and I prevailed. I ended up completing the Dark Iron Legacy quest to get the Shadow Forge Key. That will allow me to move around the instance much easier. After doing my first Ring of the Law, I was pleasantly surprised to find the epic mail chest piece, the Savage Gladiator Chain! While it's stats had nothing to do with and Elemental Shaman, I was proud to wear it. I ended up getting the legs and boots as well. I was able to eventually down every boss in the instance besides the last two. Before you get to the stone guardian who guards the Emperor, you come to an enormous room called The Lyceum. This room is famous for causing headaches, due to the 30 second respawn rate of the groups of 10 or so non-elite dwarves. You have to pull a group, down them, and move to the next one very very quickly. I could do this, only with Magma Totems. The problem is, they cost 500 mana each, and I didn't have drinks with me. I just couldn't keep up. I tried several techniques, but there simply wasn't enough mana. So I called it a night. 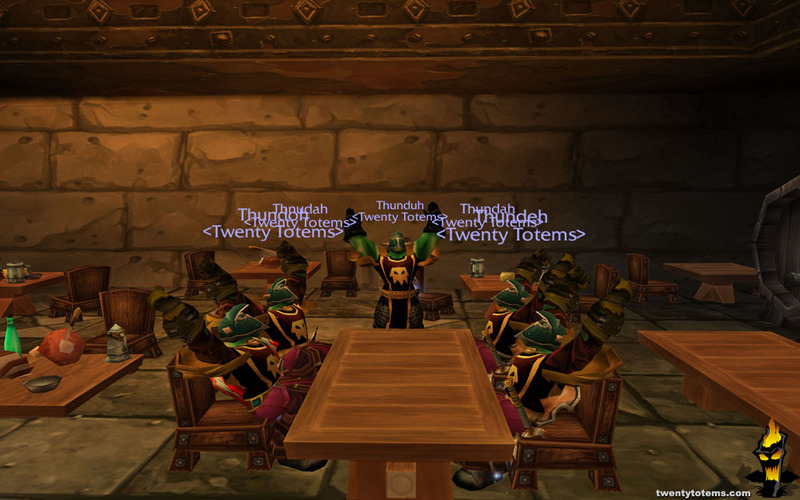 I decided the boys earned a mug of Dark Iron Ale, so we headed to the Grim Guzzler to celebrate a hard days work. While we settled into a table and ordered a round, I noticed something. I had just about cleared the largest 5 man instance in the game, and my xp was pitiful. The problem was, I wasn't really overpowered in BRD. As an all DPS group, I played differently, but the pace was just about the same as any other normal group. It was obvious I wasn't twinking anymore. I then thought about making many, many more runs through BRD, and it gave me a headache. Maybe instances won't be my grinding place as I finish my run to 70. Maybe they will be a single day of challenge, before I go back to questing where the real xp is. Time will tell. Till then, I think I should head to some high level questing areas, and see what kind of progress I can make.